There are a lot of things to take into consideration when building a pool – the size, where it will be located, and what features you want it to have. But one factor that can have a significant impact on the atmosphere and aesthetic appeal of your poolscape are the pool finishes you choose. Today’s pool owner has a number of options when it comes to pool finishes, and even more options when it comes to color and texture. 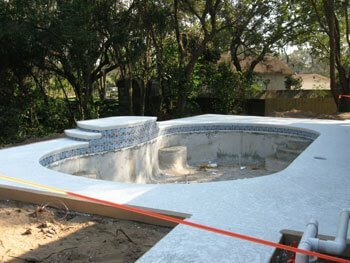 Our design experts at Tampa Bay Pools will work closely with you to determine which one will best fit your needs. Read on below to learn more about the options available and the pros and cons of each. Paint is popular for two reasons: it’s inexpensive and you have a variety of color options available to you. The primary drawback is that paint has a considerably shorter lifespan than the other pool finishes on this list, and it does not deliver that same level of modern sophistication other surfaces offer. Basic plaster is a budget-friendly pool finish that leaves pools feeling smooth to the touch. The downside to this type of finish is that it does need to be replaced every 8 to 12 years, and it can suffer from wear and tear resulting in cracks, chips or hollow spots. It also stains more easily than other pool finishes. Basic tiling gives pool owners the opportunity to create unique color combinations and shapes throughout their entire poolscape. Tiling can be the most flexible in terms of design, though it is more costly in comparison to paint and plaster. Arguably the most sophisticated of the pool finishes, glass tiling transforms pools into a glimmering mosaic of brilliant colors. Incredibly durable and long lasting, glass tiling is also one of the more expensive pool finishes on our list. Aggregate pool finishes come in an array of colors and they are more durable than standard plaster. While expensive, if the pool is well maintained these pool finishes will stand the test of time. Textured and delivering a one-of-a-kind sparkle, natural pebble pool finishes like PebbleTec are in high demand since they are as durable as they are beautiful. Pool owners beware, however, as applying pebble pool finishes can take over one week to complete (but the results are certainly worth the wait). The Choice Is Yours with Tampa Bay Pools, Inc. Located in beautiful Brandon, Florida, Tampa Bay Pools, Inc. is an award-winning pool builder offering top quality pool finishes to pool owners in Tampa Bay, Clearwater, St. Petersburg and surrounding communities. Start building your perfect backyard with My Staycation Builder, and call us today to chat about your pool dreams at (813) 684-3639.